Seems legit, but what does that Pinkish Ice barrier do? you could try to max Surface cause its too good wit Prior. Also, not many plp run maxx removal cards nowdays, so u will often see starlight more dead than useful, u can swap it for a 2nd Complosry or w.e other trap u prefer. Nice. how about running "Dance princess of the Ice Barrier" over "Defender" Her atk is higher with a awesome effect. Removal of back rows. this meta is so trap and monster eff heavy. He wouldn't stay on field that long to abuse his own effect. If your going to take out starlight. Maybe x2 complus or a complus and a fiendish. "Moray of greed" might be a card you could look into for those dead hands you might draw into. moray is too situational imo since you are using up your hand for grave setup. further more idk what to say, i run a very different version of ice barriers. the one with destiny heroes, junk warrior, dad and miracle fusion. Ice barriers with destiny, junk warriors,dad AND miracle fusion? how many cards are in that deck? Sounds very interesting and unique! just 40 lol. junk to abuse priors or sync into any other solution you might have in mind. destiny heroes because of the draw power and miracle fusion, and dad because of the amount of dark monsters you will have in your grave. stratos to search into the right d-hero and trips trade-in to get targets for either miracle fusion dad or prior. rota to get out either stratos or junk and that trips icebarrier searcher. you will be going fast throughout your deck which means faster getting into your miracles and s/t removals + great play setups. 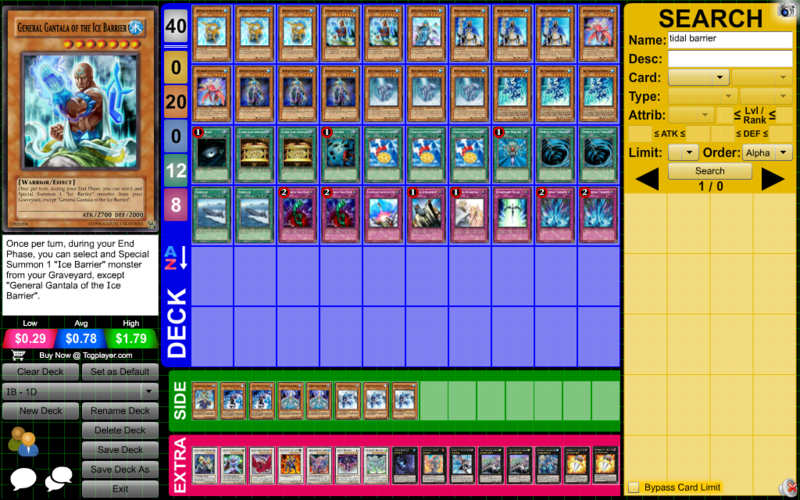 d-draw and allure if needed and gorz is always amazing... so yeah thats my deck for the so called "unique" part. on-topic: I would try Seven Star Sword. I felt like Light when his memory was rushing back. I'll have to build t and see how it does. Im just lost for words at the moment. Hmm, new meta doesn't run high trap/spell line up.. Well that you set anyways. Anti meta perhaps, but the meta is consistent about spamming in one turn, so cards like SRoad become slow, and what not. - I would try maxing surface like stated earlier by Da Koolkid. - Anywho, how has the testings with the deck been doing?